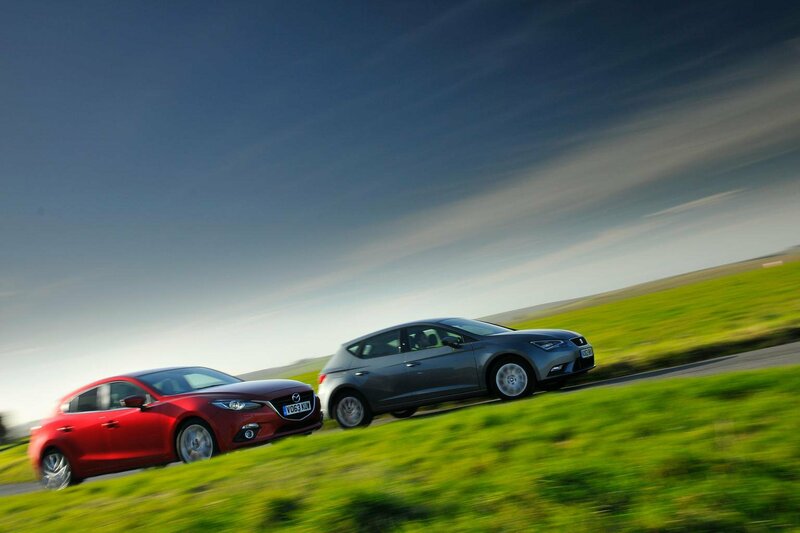 Mazda 3 vs Seat Leon | What Car? The Mazda 3 has never been a huge seller in the UK. However, this new version could change that because it gets the dramatic styling cues that we’ve already seen on the CX-5 SUV and 6 saloon, as well as their efficient engines and gearboxes. To see if the new 3 is also classy, and practical enough to beat the best family hatchbacks, we’re testing it against the Seat Leon. This is also not a common sight and undercuts the Mazda on price if you specify both cars with the entry-level petrol engines. The 3’s naturally aspirated 2.0-litre motor is more powerful than the Seat’s turbocharged 1.2-litre engine, though. The Mazda 3’s extra power helps it get up to motorway speeds quicker than the Leon, but it’s the Seat that’s generally the more pleasant companion in day-to-day driving. Yes, the Leon’s engine is much smaller than the Mazda’s, but the turbocharger helps it pull harder from lower revs and you don’t have to change gear as often. The Leon’s more precise gearchange and pedals also make life easy, and while both cars have steering that’s nice and light around town (and therefore perfect for parking), the Leon’s weights up more consistently at higher speeds and is less affected by mid-corner bumps. Just as important, the Leon remains composed if you lift off the accelerator in the middle of a bend, whereas the Mazda 3’s rear end can get quite wayward and force the stability control to intervene. The way these cars ride is less one-sided; both come with sensibly sized 16-inch wheels and do a decent job of smoothing out broken surfaces. That said, neither is as supple as the very best family hatchbacks, and the Mazda’s ride deteriorates more dramatically than the Leon’s if you specify larger wheels. You’ll also find the Leon more relaxing on the motorway. There is some wind noise, but the road noise in the Mazda 3 is more prominent and you can hear its suspension thumping over expansion joints. Most people will be able to find a comfortable driving position in both cars, thanks to the wide range of seat and steering wheel adjustment they offer. What’s more, the seats in both are supportive and there’s plenty of space. Unfortunately, the Mazda 3 isn’t as impressive in the back because the shape of its front seat backs forces adults to sit with their knees pushed tightly together or splayed uncomfortably far apart. The Leon is much better for tall rear passengers. There are fewer differences between the cars when you look at their boots, with each offering a large, square space. However, the Mazda 3 has a shallower opening that makes it harder to squeeze in larger items. On the up side, the Mazda does have less of a boot lip than the Seat, which helps when you’re trying to load heavy luggage. Both dashboards look smart and appear to be well put together. However, some of the plastics in the Leon feel a little cheap, whereas the Mazda 3 is plush throughout. The Mazda 3’s infotainment system has logical menus and you can operate its various systems via a rotary dial or by pressing large icons on the 7.0-inch touch-screen. The Leon also gets a touch-screen, which is flanked by clear shortcut buttons and is positioned high on the dashboard, so you can keep your eyes on the road. It’s only a 5.0-inch screen, though, so the icons are smaller than the Mazda’s and trickier to hit on the move. Both cars come pretty well equipped, with six airbags, alloy wheels, Bluetooth, a USB connection, steering wheel-mounted stereo controls and air-conditioning, while the Leon also gets cruise control. What will they cost you? The Leon has a slightly lower list price than the Mazda 3, and that gap only widens when you consider discounts; our Target Price team managed to haggle £1200 off the Seat at dealers, whereas only around £790 is available off the Mazda. Add the fact that the Mazda 3 will cost you more in fuel, servicing and depreciation, and that it attracts a much higher insurance rating, and it’s likely to cost a private buyer more than the Leon over a three-year ownership period. At first glance, the Leon also looks like the cheaper option if you’re buying on PCP finance. Put down a £5000 deposit and you’ll pay £174 a month for a three-year, 30,000-mile contract, whereas the Mazda comes in at £182. However, Mazda will contribute £500 to your deposit, so the 3 actually costs you around £210 less than the Leon. If you’re thinking of buying the car outright at the end of your PCP deal, the Mazda 3 extends its advantage because its final balloon payment is more than £500 cheaper. All of this helps make up for the Mazda’s higher fuel and insurance bills. Company car drivers are unlikely to consider these engines, but the Leon is the better prospect if they do, costing a 20% taxpayer around £110 less than the Leon over three years. Mazda’s new 3 is well priced, plus it has a smart cabin and a sophisticated yet simple infotainment system. However, it’s up against a very strong rival in the Seat Leon. The Leon not only has lower running costs, but is quieter, better to drive and more practical. It’s the more rounded family car and our winner here.